Wellington craft brewery Garage Project has created a limited-edition ‘Zoo Brew’ beer in support of Wellington Zoo. The beer, made in conjunction with the zoo and online auction website Trade Me, will be released this Sunday 22 November at Southern Cross Bar in Te Aro, Wellington. From 2pm, there will be giveaways, auctions, a barbeque and live music to celebrate its release. 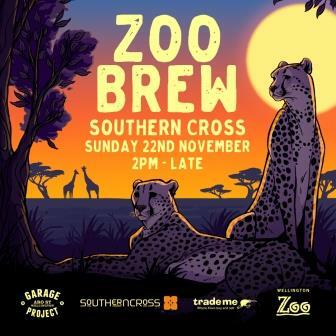 Garage Project head brewer Pete Gillespie said Zoo Brew is made with pale malt, sorghum and South African rooibus tea. Wellington Zoo partnerships manager Alicia Harris said the collaboration was a quirky and unconventional way to raise money for Wellington Zoo. The Zoo Brew label has been specifically created by renowned Wellington-based Seraphine Pick. As well as hand-painted bottles, her original art will be auctioned off on Trade Me from today (Wednesday 18 November) to raise money for the zoo. New Zealand’s first zoo, Wellington Zoo was established in 1906 over 13 hectares in the capital’s green town belt. It is home to more than 500 different animals, including lions, giraffes, meerkats, and tigers.